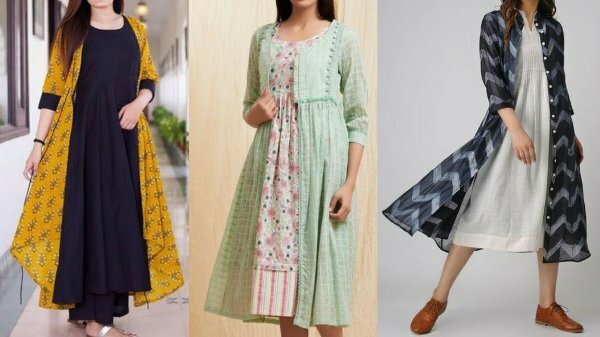 The humble kurti can be your go-to item of clothing for daily wear and it can be elevated to a fashion statement on the party circuit, all depending on how you wear it and what you wear it with. Give your plain kurtis a makeover with some gorgeous shrugs, or make your fancy kurtas stand out with an additional layer. Find here the latest kurtis with shrugs, both long and short, and styling tips to keep you looking your best. A shrug is a short coat or a wrap that can be worn in addition to the original outfit. Shrugs come in different lengths and styles. There are long shrug designs, short shrugs, sleeveless shrugs, ones with sleeves and those with stylish sleeves. Shrugs are perfect for all kinds of seasons and a perfect accessory in terms of the style quotient. When choosing a shrug, avoid picking too many prints in one or loud colors. Choosing floral prints are summer perfect where an all-over print would really compliment a solid colored kurti. Kurtas or kurtis are part of India’s ethnic apparel, and when paired with a shrug, they give off a contemporary look that complements the attire. A shrug always has a place in a woman’s closet and it is one of the best accessories to have that can change your entire look in a jiffy! 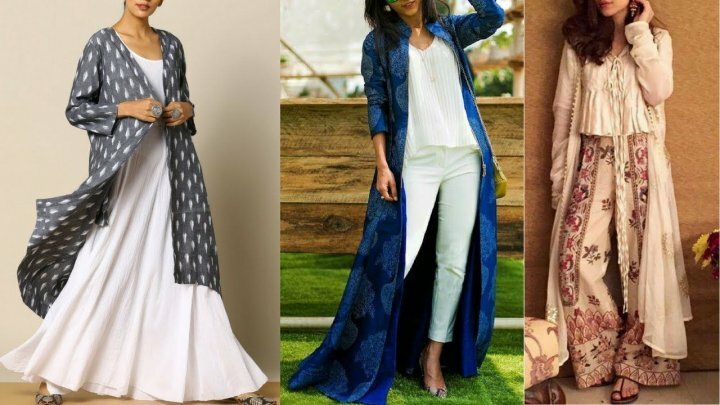 Whether you don a sleeveless shrug in summers, full sleeves to save yourself from tanning, a woolen shrug during winters or fringed shrug for a stylish look, a shrug is a companion in every form or style. Different types of shrugs can make a unique style statement when paired with different outfits. Summers are usually all about layering, so an assortment of shrugs would be good keep the style quotient rolling. When it comes to cloths, choose fabrics that are breathable and light, avoid knits or heavier materials. Sleeveless shrugs are best to wear in the scorching sun. In terms of prints and colors, opt for floral prints or solid colors, mostly pastels or vibrant colors for days and darker colors for night events. You can also try minimal graphic prints, designer styles, and tropical prints. Long shrugs are usually knee, hip or ankle length and look amazing for casual events, paired with jeans or shorts. Paired with short kurtis or sleeveless kurtis and jeans or leggings, they make for a laid back style, perfect for a rushed day, complete with a pair of sneakers or flats. Cropped shrugs are cute and short, extremely stylish, often longer till waist or even higher. They look glamorous with printed kurtis during summers in solid colors or printed with solid plain kurtis. Cropped shrugs style are one of the best ways to highlight body curves. Fringed shrugs have several threads hanging loosely from the hem, looking very stylish and giving off a retro vibe. They offer variety with a long shrug. Lace shrugs are a must have for a party event. Perfect covering you up, if you feel uncomfortable going sleeveless, it can go very well with a Black Kurti and jeans combination. You can spice up the look with a little sequins work on it. Work shrugs can help you use pieces from your summer wardrobe even in winters. Generally cardigans are preferred over a shrug, but in case you don’t have anything that’s smart yet handy for office wear, opt for bolero cardigan with ruffle hem and sleeve details. The weekend shrug is perfect for layering over a round neck kurti and teaming it up with Jeans. With a flattering waterfall style in a light weight fabric, it will go well for a casual outing. The applique shrug is a beautiful detailed applique shrug with three-fourth sleeves and a cropped style with a chiffon neckline would look really chic for formal events. Shrugs come in both long and short sleeves and may be knitted or be velvety. There are denim shrugs also. Shrugs generally cover the back of the upper torso with a little cover in the front, ending just a little above the waist. They may even be shorter and not reach even at the stomach level. Used almost like a waistcoat, a shrug gels well with all kinds of outfits from the modern denims to the ethnic kurtis. And like most other apparel, shrugs are extremely fashionable too. One such popular category of shrugs in the net fabric. A loose weave hand-knit white shrug in net looks really chic over a short kurti and Jeans. A woolen shrug with bell sleeves and a full sleeve kurti looks attractive too, for a casual wear. A woolen cream crochet shrug comes with a really short length, covering the back with a high neck finish and would look good on young girls. Differently colored shrugs like an Olive Green with short sleeves will win many a hearts over, with a light colored kurti. Then, there’s a pullover style shrug that gives off a modern look with a black kurti underneath, more stylish during winters. For evening wear or party occasions, a self-stitched work shrug over a sleeveless and bodice covering long kurta looks fashionable, a see-through net shrug over a similar looking kurti would give you a different and striking look. Some shrugs come embellished with antique bead work, apt for vibrant colored kurtis for party wear. More or less always in fashion, Anarkali Kurtas are appropriate for most festive and ethnic occasions. A shrug only adds to the charm of an Anarkali. 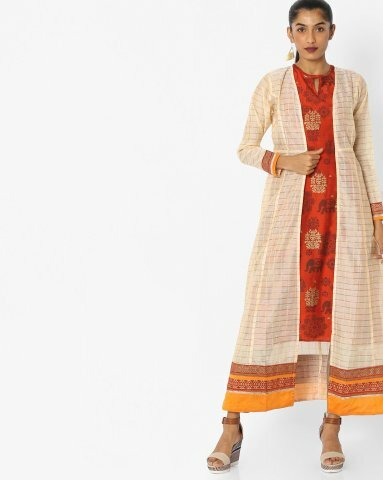 The off-white crinkled Anarkali Kurta with an Embroidered Shrug comes with round neckline, has a chevron print along the hemline, is sleeveless and has an attached lining. It is paired with a woven embroidered shrug with sequins and sheer work, a mandarin collar with an open front and short raglan sleeves. The ensemble is made of pure cotton and is best machine washed. It is priced at Rs.2,039 on Myntra. 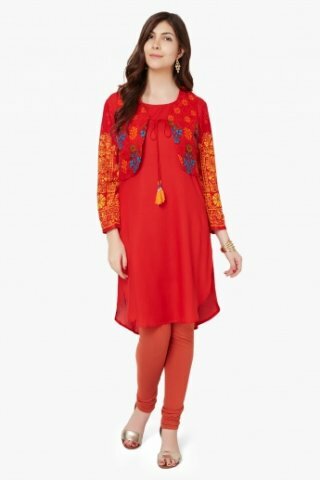 Seemingly dull otherwise, this orange-red straight kurta with a round neck and full sleeves is a regular fit in solid color, good for casual wear in viscose fabric. When paired with a printed short shrug with yellow and blue designs and an open front with tie-on tassels. it will spice up the otherwise plain kurta. Buy the Biba Kurta & Printed Shrug for Rs.899 from Lifestyle Stores. A printed kurta blends well with a printed or solid colored shrug and the combination of a long kurti with a shrug though may look casual, yet exude a certain freshness and style to the ethnic outfit. 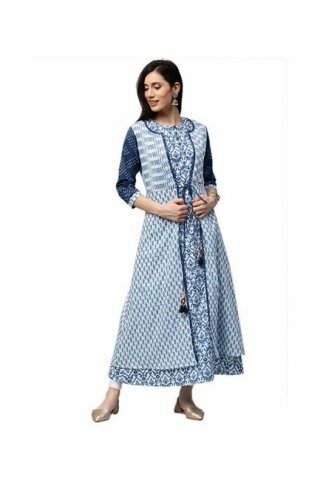 This navy blue and white kurta made of cotton fabric comes with a shrug featuring three-quarter sleeves, a round neckline and a beautiful printed pattern. It is for regular fit and is of ankle length. Priced at Rs.1,919, it is best hand-washed. Buy the tatacliq Jaipur Kurti in White and Navy Print with Shrug on tatacliq.com. Embroidered shrugs look decorative, elegant and graceful. 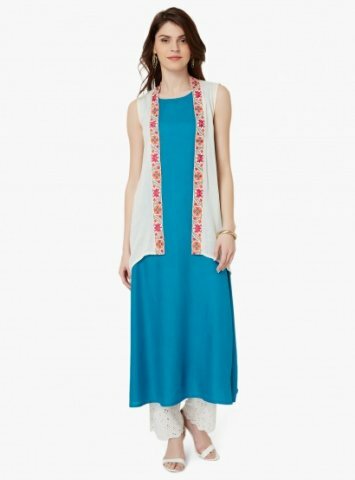 The sleeveless blue kurta with a round neckline in viscose, paired with a sleeveless embroidered shrug in white the ensemble is apt for casual wear and is priced at Rs.1,699 on maxfashion.in. A printed kurta with a long shrug would really look pretty, looking distinct and if you combine it a palazzo, it would give off a designer feel. This long shrug in a classic check print from India Ink with a contrasting hemline highlighting the fusion between casual and hip fashion. The fabric is chanderi and the shrug is priced at Rs.1,280 on Ajio. The shrug can be paired with both printed and solid plain kurtis. Pair up this cotton solid colored kurta in a comfortable fit with a with a casual short sheer shrug for an effortless and elegant look. It has three-fourth sleeves, a mandarin collar with a V neckline and fixed buttons. It is priced between a modest Rs.399-784 on Amazon. Soft, fashionable and sleeveless, the VR Designers Women Sleeveless Casual Short Sheer Shrug is of regular fit and is priced between Rs. 273-275 for different sizes. It is available in a soft pink and green on Amazon. 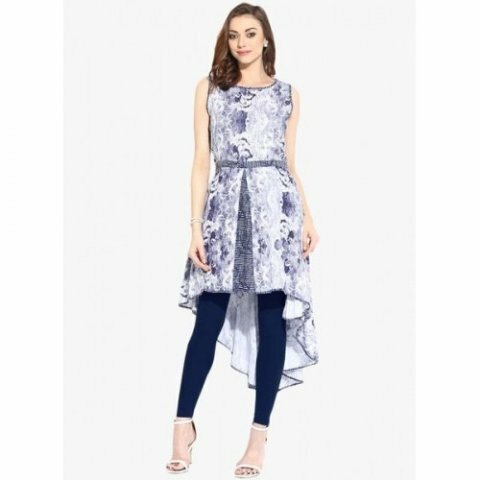 This Dazzle Designer Long Kurti with Long Shrug for Women are made of rayon fabric, with the kurti sleeveless in navy blue, while the long shrug is a contrasting peach-orange combination in print with ¾ sleeves. This lovely combination is priced at Rs.1,299 on amazon.in. It's always nice to have a few eclectic items in your wardrobe that can be mixed and matched with a number of ensembles to create different looks. This Viva N Diva Black Poly Cotton Short Jacket is one such. This black poly cotton short jacket can be paired over a kurti, making it a chic choice, and will look just as nice over a dress. The jacket shrug is very comfortable and designed with a floral embroidery pattern, priced at Rs.1,199 on glam-road.com. 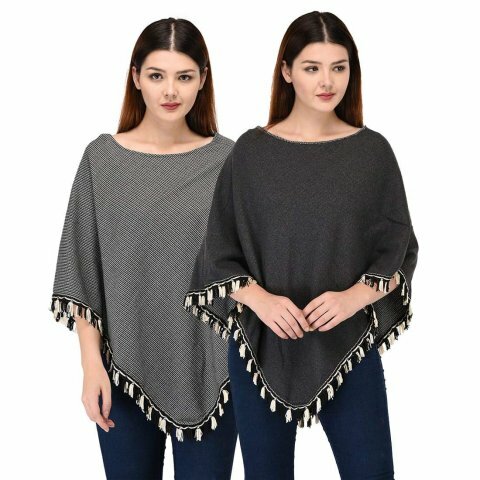 This reversible cape poncho shrug is black and grey on different sides with tassels on the hem. With a loose fit and hip length, with a boat neck, the fabric is a soft poly cotton, best worn during monsoons. The SKiDlers Women's Reversible Cape Poncho Shrug is priced at Rs.549 on amazon.in. Layer your kurtis with this uber smart asymmetrical shrug for casual wear in viscose fabric. It is a printed and sleeveless shrug that’s best machine washed and available in black and dark red colors. 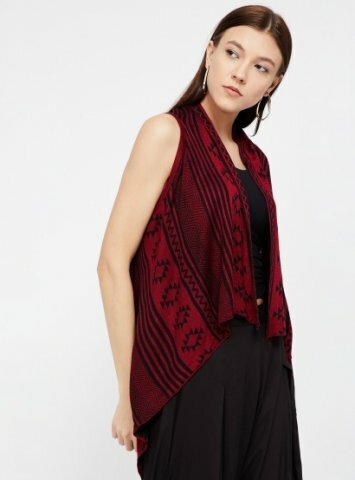 This Ginger Printed Asymmetrical Shrug is priced at Rs.909 on lifestylestores.com. Kurtis are smart choices for most working women, college girls and housewives for most social events. 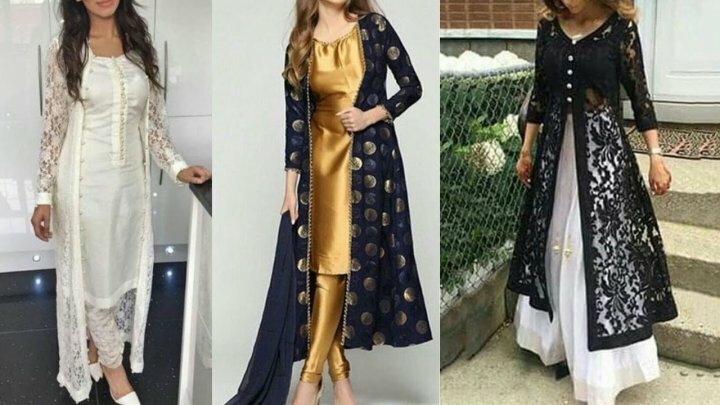 To keep up with the growing demand for Kurtis, there are varied options from ethnic to indo-western kurtis with different cuts, designs and patterns. And most shrug styles pair well with these styles. For women with pear shape, hour-glass or rectangular body types, tail cut kurtis with a layered pattern are in fashion. 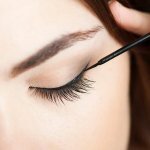 These are usually short from one end and have a tail effect on the other side. 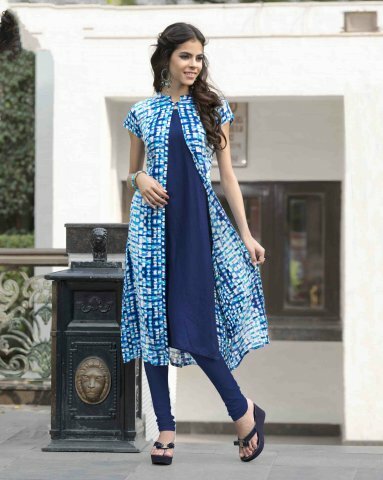 Paired leggings, jeans, and jeggings, these kurtis are good for most social gatherings, college events or casual wear. They can be accessorized with jhumkis, danglers, cuff bracelets and clutches or sling bags. 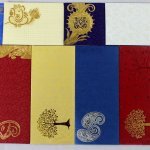 You can choose from cotton, georgette, crepe, polyester, rayon or poly georgette in fabrics. Wear ankle strap heels, pumps, juttis or sandals to complete the look! 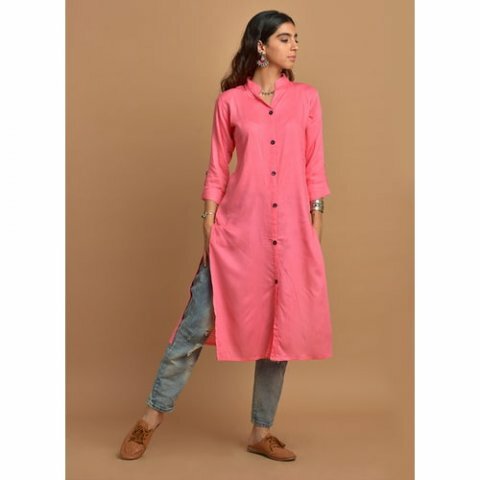 An A line kurti is most popular among the youngsters, that reaches the calf or ankles and has a flare at the waist which makes an ‘A’ shaped panel. You wear it with churidar, Patiala salwar, matching or contrasting capri, dhoti pants and accessorize it with delicate bracelets, studs, wooden bangles and hand bags. On the feet, go for bellies, pumps, mojris or Kolhapuris. This style is good for pear shaped, rectangular or hourglass shape body structures. 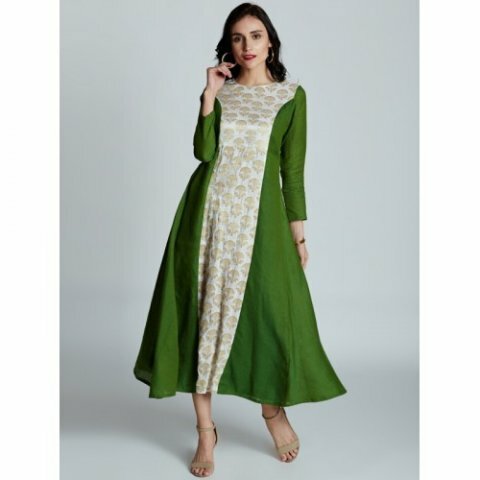 A trail cut kurti has C-cuts on both sides and is good in a georgette, chiffon, silk or crepe fabric with border embroidery to enhance the designer cut. It’s apt for evening wear with a pair of leggings, jeans, tights, bottomless and tulip pants. Delicate chain watch, a choker necklace, anklets and stud earrings would go well with it with a pair of gladiators, sandals or pumps on the feet. It is perfect for women with triangular, hour glass or pear shape structures. Angrakha has two similar or contrasting flaps laying on each other, tied with straps on the side. For a more ethnic touch, they can be adorned with beads, tassels or pom poms. It adds quite a feminine touch and stylishly so to apple shape, rectangular, pear or hourglass shaped bodies. The length is usually knee or calf long and best made in silk, cotton, georgette, net or chanderi. You can accessorize the style with danglers, oxidized jewelry, diamond bracelet or a classy clutch/potli bag or tote. Wear it with a pair of jutis, sandals or wedges. The shirt style is a fusion of Indian kurti with a western shirt that is a trendy option for office wear. Styled both professionally and stylishly, it can be paired with treggings, pants, palazzo, skirts or jeans. Women with rectangular structure, pear shape or hour glass body type can wear this kurti in short, knee-length, calf length or ankle length with pumps, flats, bellies, moccasins or peep toes and accessorize with stud earrings, fringe necklace, a watch and a sling, backpack or totes. This style is mostly designed for flattering feminine curves and known for their shaped seams which start from the shoulders or armhole and end at the waist or go further down, shaping the entire fabric across the waist & hips. The kurti is styled with a collar neck, button down pattern or embroidered yoke and ¾ sleeves. Its typically worn for daily wear with churidars, leggings, tights, palazzo or jeans. Works well for women with inverted triangle shaped body, apple shape, strawberry shaped or hourglass body structure. You can accessorize the style with bangles, stud earrings, cuff bracelet and a clutch/tote or sling bag. Wedges, flats or kolhapuris would like good as footwear. Fashion trends change all the time and though you may want to keep up with them, not every style is going to suit you. Your body type, height and personal style must be considered before adapting the latest look. 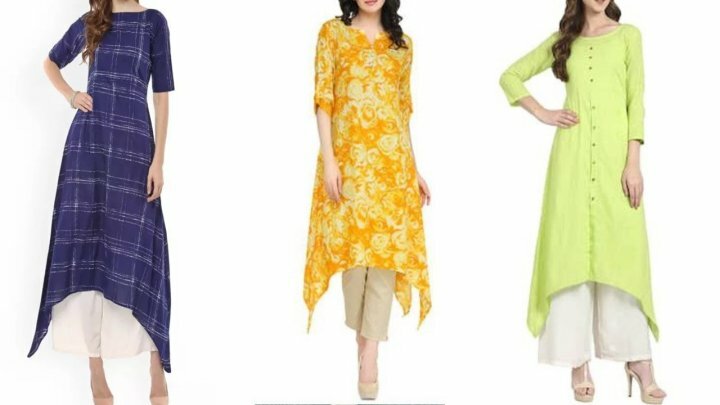 The good thing is there are so many types of kurtis and shrugs that you can easily find a few that will make you look great; all you need to do is choose with care.